A Wiper is a type of seal used to exclude contaminants from entering the cylinder. 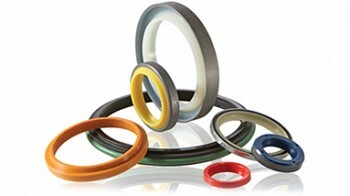 Besides direct wear to the rod seal, external contamination entering a hydraulic system can have disastrous consequences. Contaminated hydraulic fluid can quickly wear out seals, clog filters, and damage machined surfaces. However, a wiper can induce a pressure difference between the wiper and the main rod seal, which can cause either the wiper or rod seal to be ejected from its groove. All Seals sells many different kinds of wipers, from relatively low pressure solid nitrile wipers, all the way up to heavy-duty metal clad ones. Many are also available in a wide variety of materials depending on the type of fluid or operating conditions the wiper experiences. Seal good in, wipe bad out. In the industrial fluid and hydraulics fields, contaminants pose a constant threat to infiltrate sensitive systems. There’s tremendous pressure on seals, and manufacturers must rely on flawless wipers to continuously seal out debris. That’s why All Seals wipers are your best line of defense. We stock every type of wiper for every application. With our world-wide network, we can source even the most difficult-to-find wipers. If you require custom forms and fits, we’ll design and create a wiper that fits your plan to the T - from prototyping to testing to certification. We also save you time and trouble too with our value added services like JIT/Kanban programs, pre-production and kitting, custom product markings and your choice of packaging options. All Seals is your one-stop resource for everything, including peace of mind. For more information, quick quotations, expert consultation and responsive customer service call us at 800.553.5054. These wipers are designed to retrofit old MS-33675 grooves. They’re typically numbered for the MS-28776 design guide. D Wipers offer Improved performance without wiper gland modifications. RT Dygert offers four styles. A stainless steel spring energizes this wiper’s lip for heavy-duty applications and scraping environments. This wiper/rod seal combination can eliminate the need for both a rod seal and wiper, reducing costs.